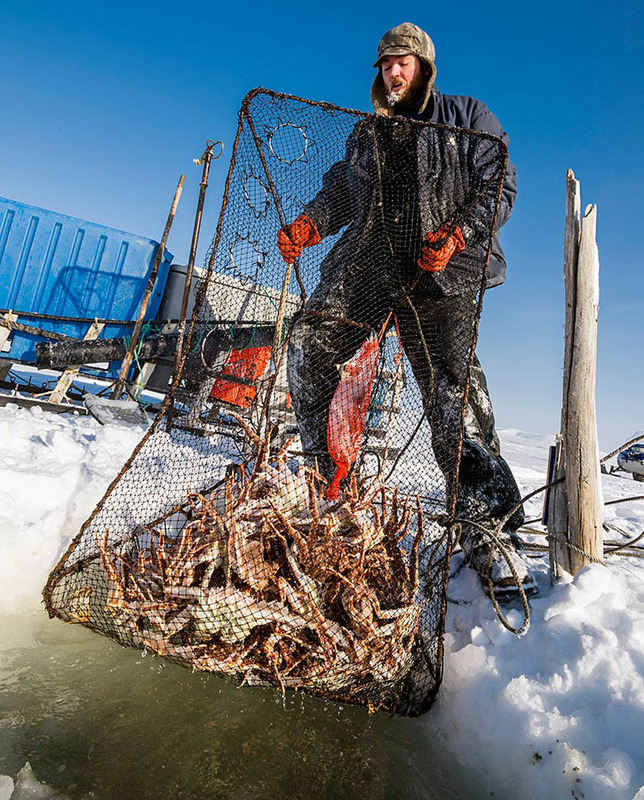 Phil Pryzmont hauls a red king crab pot from the pack ice on the Bering Sea in the Norton Sound, near Nome, AK. I recently returned from photographing the golden king crab fishery in Southeast, AK. Seeing all the king crab reminded me of being in Nome this time last year documenting the red king fishery off the ice in Norton Sound. 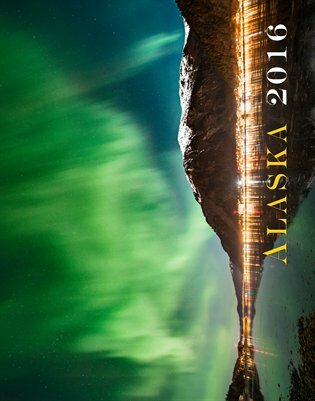 The dissimilarities between the two fisheries couldn’t be greater in geography and how the crab are harvested: one involves snow machines on pack ice, the other a 58’ limit-seiner plying glacially fed waterways over a thousand-feet deep. 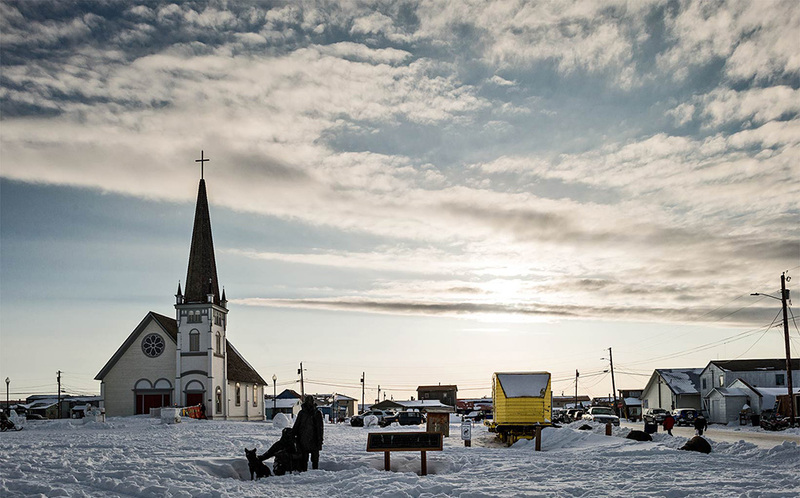 Nome is best known for its gold nuggets and being the finish line for the world famous Iditarod sled dog race. It is also home to numerous fisheries: red king crab, halibut, herring, salmon, and baitfish. The majority of fisheries around the state take place from Spring to Fall, Nome’s winter red king crab fishery is one of the outliers. 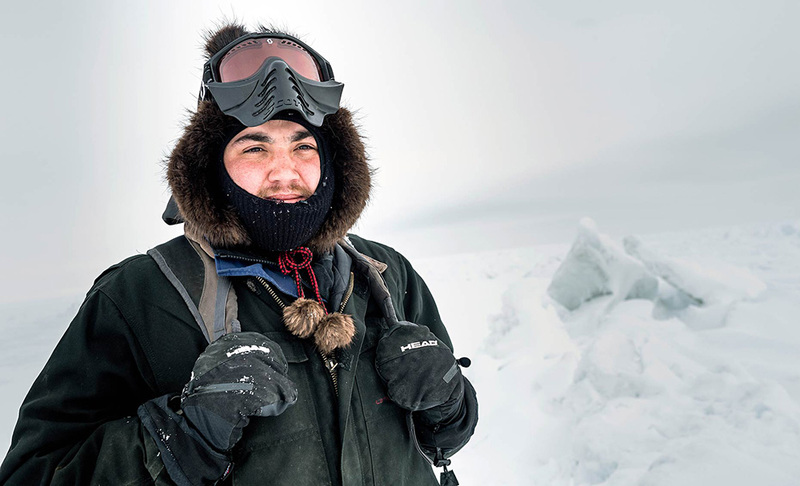 Winters in Nome can be severe with temperatures hovering around zero degrees Fahrenheit and with a solid fetch from the ice pack on the Bering Sea, winds can drive temps down to -60 degrees. 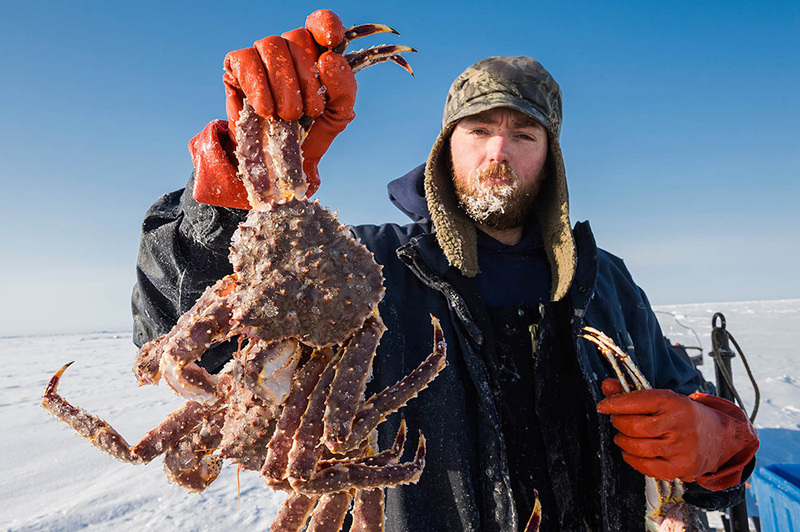 Like most fishermen, Nome’s winter king crabbers take the inclement weather in stride donning extra layers and by using insulated totes on sleds to keep the crab from freezing solid in the frigid sub-arctic air. 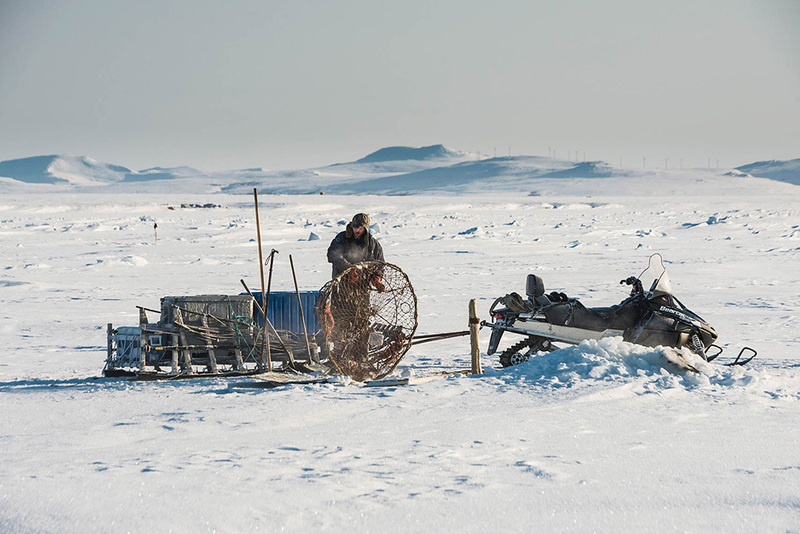 The fishermen use snow machines to access the fishing grounds just outside of Nome, driving roughly 10 miles on the pack ice through pressure ridges to arrive at their pots. The holes in the ice are covered with plywood sheets laminated to insulating foam, so that they don’t have to recut each hole every time they run the gear. 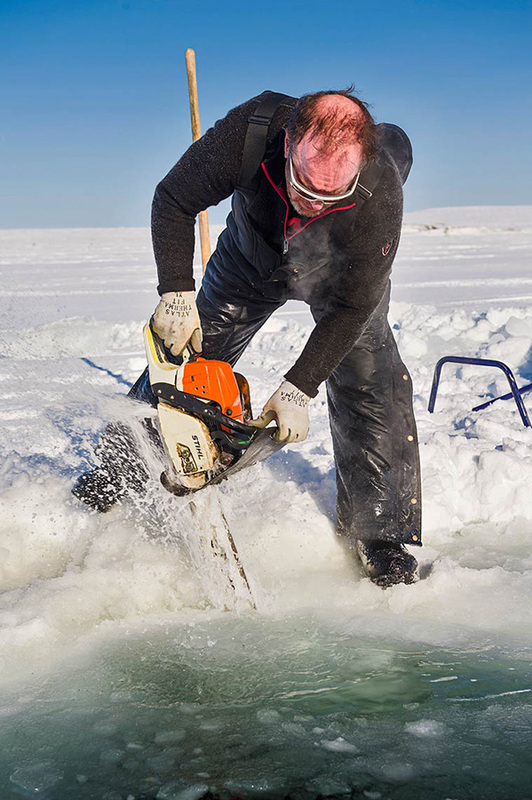 Even with the covers most holes have to be cleaned up using large pry bars, picks, ice augers, and chainsaws; so that the pots can be hauled through the opening in the ice. Typically the pots are within a few hundred yards to a mile off shore and in 30-50 feet of water. Smaller pots can be hand-hauled, while larger pots are hauled using a hitch on a snow machine to bring the pot and crab to the surface. 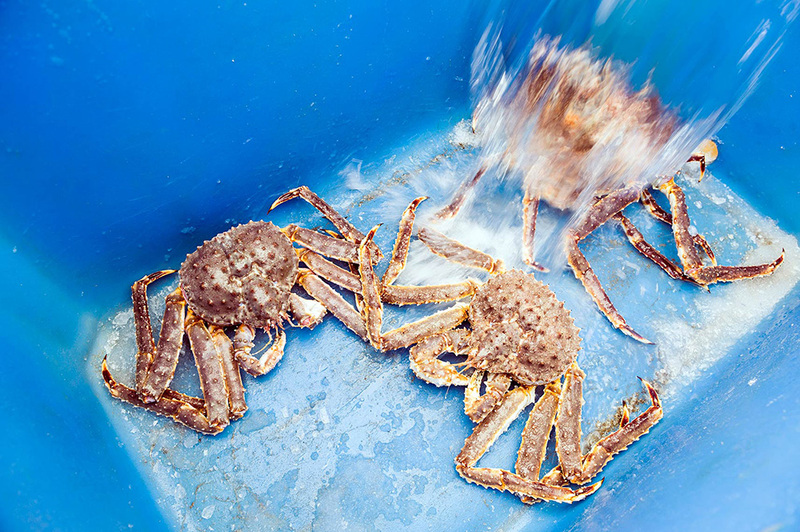 Once the pots are on the surface the fishermen quickly return sub-legal and female crab to the water, so that they don’t freeze, and place the keepers in insulated totes filled with water. Norton Sound’s red king crab are a genetically distinct stock and as such are not as large as red king crab from the Bering Sea. A legal Norton Sound red king crab measures 4.75 inches or greater across the carapace, main body of the crab, compared to 6.5 inches for the Bering Sea and 7 inches in Southeast, AK. They have a slightly sweeter taste than other red king crab and the texture of the meat is softer due to their smaller size. The winter king crab fishery provides live crab to markets in the United States all the way to Korea. The crab are packed in Styrofoam crates, wrapped in wet rags and gel packs, and shipped to the buyer by plane. 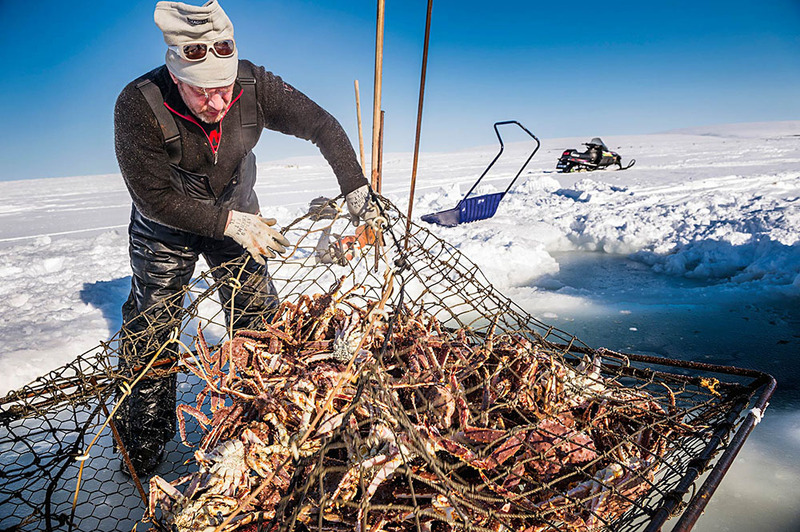 The 2013 winter red king crab season in Norton Sound crushed all previous records with fishermen hauling in 22,639 crab through holes in the ice, besting the previous record set in 1977 of 9,625 crab. 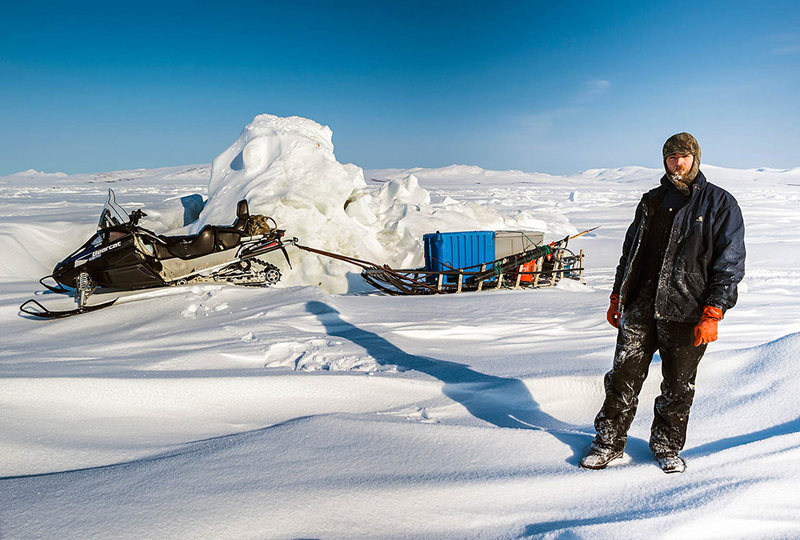 I only had three days on the ice with the fishermen, but I have to say that is one of the most unique fisheries I have yet to experience. While hand hauling pots of king crab as a kid from an 11-foot Boston Whaler, I never in a million years would have imagined hauling pots using a snow machine through 3-foot thick pack ice. Despite the differences in harvesting the crab, the reward is the same, fresh mouth-watering king crab claws and legs. Old St. Joseph’s Church on Anvil City Square, Nome, Alaska. 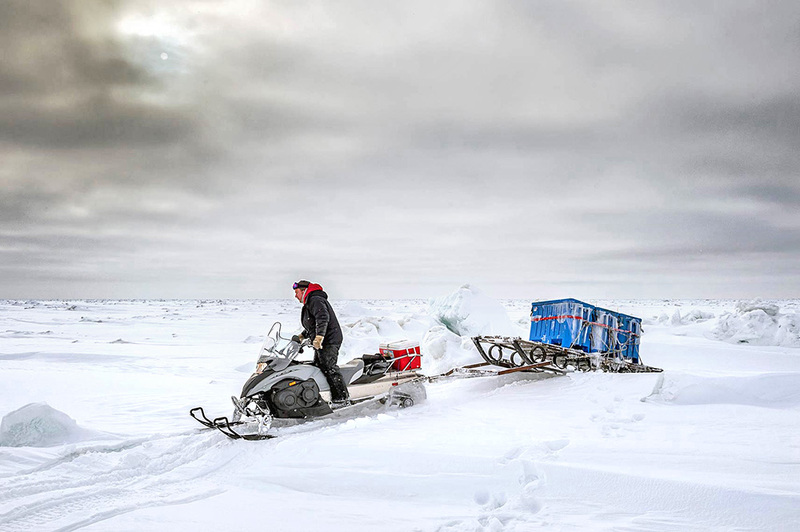 Adem Paul Boeckmann crosses over a pressure ridge in the pack ice with his snow machine and sled while heading to the next pot. Adem and his crew Scott Payenna finish cleaning ice from the hole before hauling the pot. Adem uses a chainsaw to cut back the ice. 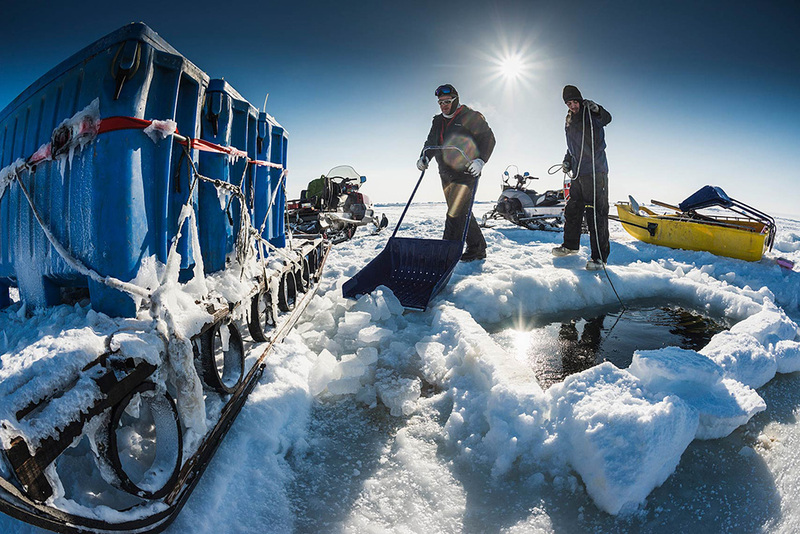 Periodically the holes refreeze or the ice shifts and the fishermen have to cut the edges back so the pots can be pulled from the ice. 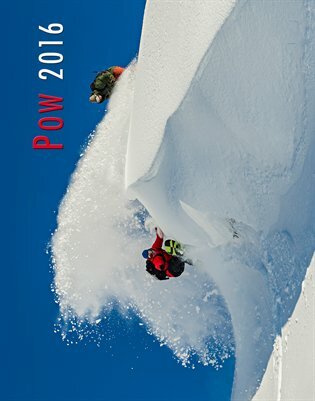 Scott uses his snow machine to pull the pot, while Adem waits to catch it on the surface. The crab are placed in insulated totes and live tanked before being sent off to live markets in the United States and as far off as Korea. Scott stops to scout a way for the snow machines through the pressure ridges in the pack ice. 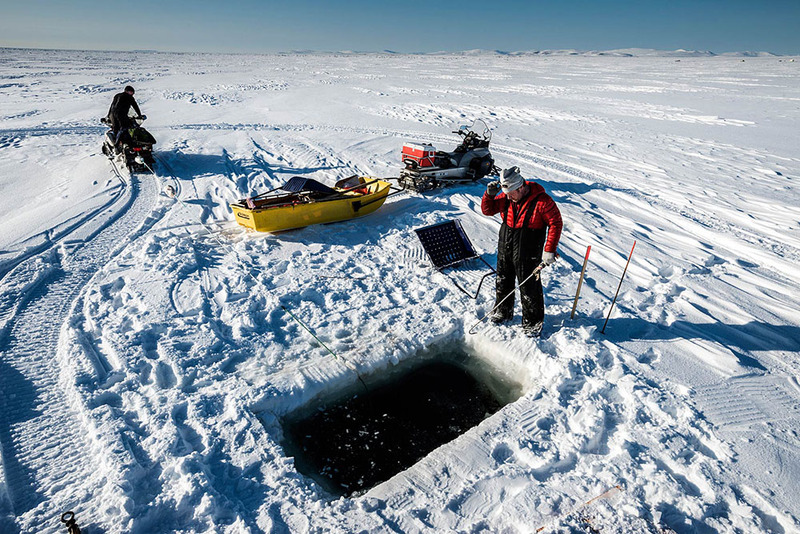 The ice can shift dramatically, between checking pots, causing the fishermen to search out new routes in the ice or even occasionally lose gear. 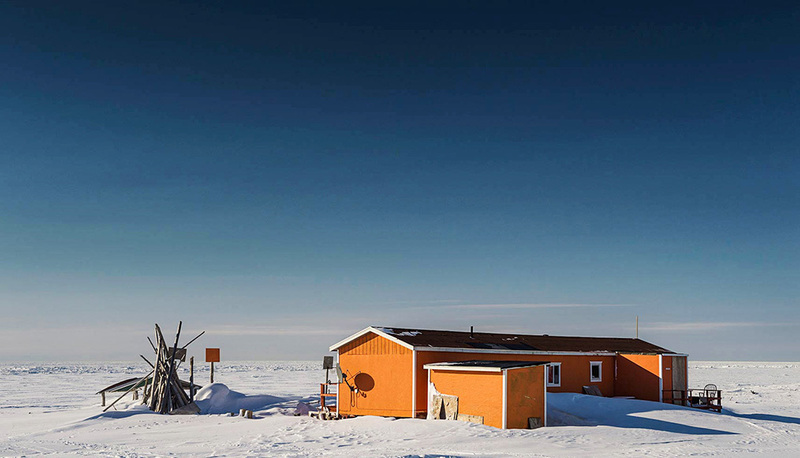 A summer fish camp at the edge of Nome, AK. Portrait of commercial red king crab fisherman Phil Pryzmont on the pack ice of the Bering Sea near Nome, AK. Phil hand hauls a pot full of red king crab. Phil shows off his catch. I’m not sure if the crab come as close to the coastline near other Northwest AK communities in the winter. Otherwise people do ice fish for sport and subsistence in other areas of the state.